Haiti is extremely vulnerable to natural disasters with more than 90 percent of the population at risk. Hurricane Matthew battered the south of Haiti on October 4, 2016, which was the most devastating disaster since the 2010 earthquake. Improving access to quality health care is a way to invest directly in Haiti human capital. 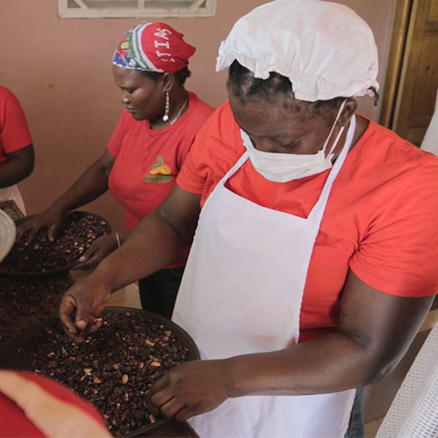 With help from the Strengthening Agriculture Public Services Project, an organization of dynamic women is enjoying a new boom. Haiti is extremely vulnerable to natural disasters with more than 90 percent of the population at risk. Last year, Hurricane Matthew battered the south of Haiti on October 4, 2016, which was the most devastating disaster since the 2010 earthquake. It caused damages equivalent to 32% of GDP. In the country’s Southern Peninsula the losses had a long-term impact on the livelihood of the affected communities. This project aims to increase access to electricity for 600,000 people, promote renewable energy sources and improve the viability of the public power sector.